I’m so excited to be a part of the 31 Days of ABCs hosted by All Done Monkey! I have the honor (hehe!) of sharing the letter ‘U’. 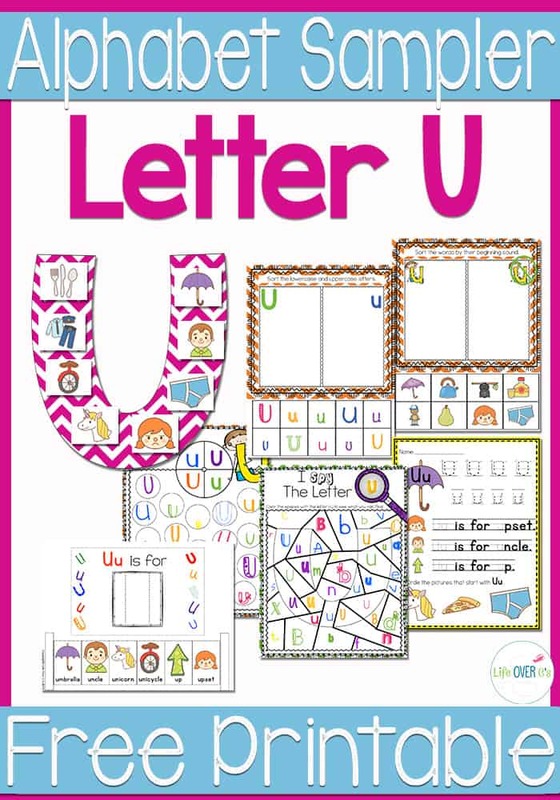 I hope you will enjoy our U is for Underwater crafts and make sure to download the free, interactive printable letter ‘U’ pack at the end of the post. My littlest one is three years old and even though she is not ready to learn the alphabet yet, due to her delays, she does love the animals of the ocean. So we had some fun making a couple U is for Underwater crafts while we talked about the ocean animals. We started off by making this super fun ocean discovery bottle. I was so excited to find a dolphin shaped bottle in the sand art section of the craft store. The lid doesn’t seal on its own like a regular water bottle would, but I wound plumber’s tape around the opening underneath the cap, added hot glue to the top inside of the cap and then finished it off with a few more rounds of plumber’s tape for good measure. Inside the bottle we put some glitter, ocean animal buttons and beads, green sequins, and some extremely tiny gold beads. The gold beads added a level of discovery that I didn’t expect. When you tilt the bottle up and down, the beads rush through the bottle making a sound just like the light crashing of waves on the ocean. So fun! Shiloh, my three-year old, just loved looking at it! We found the stickers for $1.00 a pack at our local craft store and Jaida drew in some coral and seaweed just for fun. They had a lot of fun making their U is for Underwater crafts and I hope you will get a chance to try them out yourself! Get the full Alphabet Bundle here! I love that you made such creative crafts from bargain finds! And your printable pack looks wonderful!